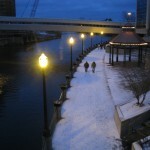 I know it seems a bit late in the year to be discussing the Lansing River Trail. Snow has arrived and temperatures are dipping, but for some people, the outdoors beckons year round. And one of Lansings most enduring and endearing treasures is our river trail. It has over 13 miles of multi-use, non-motorized trail of either smooth macadam or wooden boardwalk where it actually skirts over the banks of the Grand and Red Cedar Rivers. It is scenic and fun, and, well worth the trip to enjoy it. Whether youre running it in the hot summer sun, or strolling along it in a winter wonderland, holding hands and doing a little autumn leaf peeping, or even walking the dogs, this trail connects you to some of my favorite Greater Lansing places. An urban downtown, artsy Old Town, Turner-Dodge House, grassy parks, Potter Park Zoo, Michigan State University, Moores River Dam and the Eckert Power Station, Brenke Fish Ladder, Lansing City Market, past historical sites, Impression 5 Science Center and R E Olds Transportation Museum, Soldan Dog Park and Hawk Island Park. Its not all a beauty shot, though. In places, it will take you behind factories and manufacturing facilities and maybe not to the prettiest places in town, but then low and behold, you emerge into a lovely park or riding alongside some ducks in the river.For you bicyclists, its got some great over/under bridges (which I hear you love,) some stretches over the water and back to the macadam. And when you hit the boardwalk it bumps along adding a little variety and excitement, too.The Lansing River Trail was recently ranked among the top ten trails in the country, so Im glad to hear other people think its as great as I do. So dont miss out. For up to date construction, flooding and general maintenance, check out the Facebook page. 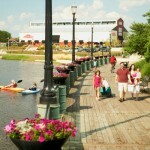 To find out points of interest, parking options and more, find them on the web at http://lansingrivertrail.org.